I thought I'd start a thread for all of us to honor our fathers on their special day today. Happy Father's day to all of you guys out here. Be it featherless kids, feathered kids, furry kids or no kids. if your a guy, you've probably been a father figure to at least one critter in your life! I will start off by telling a little about my Dad. He was an old time cowboy, worked most of his life on the SMS, Swenson Land & Cattle Company about 30 miles from where I still live. He never married until he met my Mom. She was probably the only wild filly he could never fully break. He was 54 yrs old when I was born and although I have 1 older brother, now gone and 2 older sisters, one gone as well, I was my Dad's only child. Dad was a very gentle man who taught himself to play a fiddle. I can still hear him play it. Dad was the one who started me on a long road of keeping & loving all kinds of critters. He was always bringing me baby cottontails & jack rabbits to raise he would find while out riding the pastures. Dad even brought me my first baby bird. He found a baby scissortail that had fallen from its nest. I lost my Dad to a heart attack in 1967 when I was 12 yrs. old and I still miss him to this day! I love you Daddy tho you have been gone for almost 46 yrs, your memory lives on in me and my son Jory. 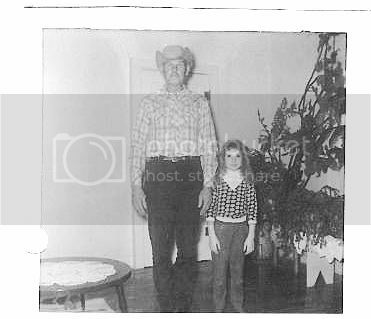 Here is a picture of my dad & me when I was 11 yrs. old. I wished I had a better one to post, but I lost all my photos of everyone in my family when my house flooded in Aug. of 2005 out here. So if anyone wants to, please post photos of your Dad and tell us a little about him here. What a nice memory to have of your Dad. I would have to do a lot of digging to find a picture of my Dad and me. I come from a large family and both my parents worked. Mom at night and Dad during the day. My Dad liked to garden and could grow a stick into a tree, I've seen him do it. He was a chef by trade, even when he was in the Navy. These are two of the things I love to do must. Happy Father's Day to Dad's everywhere!! !